I love a good ghost story. Don&apos;t you? Hargrave Hall in Danville is full of them and whether fact or legend, the happenings at this historic old building will send a chill down your spine. Over 130 years of rich history lies within the walls at what is now Danville Town Hall at 49 Wayne Street. For 68 years beginning in 1878, the historic building was home to Central Normal College. More than 75,000 students attended this teacher training school over the years, until the end of World War II when the GI bill came into existence and enrollment dwindled as students were able to attend larger colleges. In 1951, it was taken over by Canterbury College and then by the Danville School District in the 70&apos;s. Finally in 2009, it was purchased by the town of Danville and has become a central hub for the parks and recreation department as well as the Danville Police Station. Legends have swirled about the stories these walls may contain, but the happenings over recent years are astounding. Parks and recreation employees tell stories of hearing footsteps in the gymnasium above the office. The cameras guarding the space are motion detected and will activate, but not a soul will be there: at least not one that can be seen with the naked eye. Employees have also experienced an eerie gust of wind on a still night while walking outside past the cemetery to turn off lights in the gym. Police officers have reported hearing noises and footsteps, stomping, banging and clanging, late at night while doing paper work. But when investigated, they turn up no one. A janitor a few years back refused to clean rooms on the 2nd floor because of doors closing behind her, sounds of water running in a sink with no explanation and weird clanging and banging noises. Not too long ago, a ghost hunter&apos;s group came in with all of their equipment to see if the experiences had any merit. 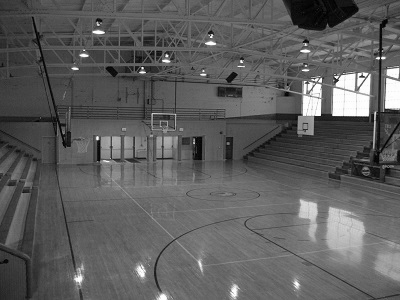 They were able to capture a photo in the gym that shows an apparition that appears to be walking up the steps. Those in attendance tell of a warm night that turned inexplicably cold and chilly right before the photo was taken. Coincidence? Maybe. Maybe not. Many are convinced that someone or something occupies the space and some of their stories make the hair on the back of my neck stand straight up. Now, here&apos;s the fun part. You can check it out for yourself at the Haunt at Hargrave Hall from 7-11 p.m., Oct. 18 and 25. They will even have a special &apos;lights on&apos; haunt from 5-7 p.m. on the 25th for younger children and those of you who may be a little more skittish. Cost for the haunted house is $5 a person. Is it just a legend? Is there really someone or something walking the halls at Hargrave? You can decide for yourself later this month...if you dare.